Chances are that you are reading this article because going to Alaska is high on your priority list and fishing garners a major portion of your interest in such a trip. Let us offer a few considerations to help insure your success in filling your trip with many positive memories. Evaluate the needs and abilities of those coming with you. Understand “run timing” and how it affects what you can catch. Some remote experiences aren’t that remote. Self-guided versus Charter Boat fishing. How much time do you want to spend fishing in a 24-hour day? Bag limits versus possession limits. What puts value into the trip. Carefully consider the abilities of the people who will be coming to Alaska with you. All who fish are not created equal in ability, stamina, and size. A group of 20 to 40-year-olds, in good physical condition, can wade streams, climb mountains, row boats, and generally fish for long hours. If you add children or older people to your group, you need to be realistic about their physical abilities. One over-strenuous trip with your dad may make him believe he’s too old to fish in Alaska when in reality he can go many more times if you choose activities within his abilities. Younger children may need some time off from fishing, especially if fishing is slow or the weather is inclement, so look at what other activities may be available to meet their needs. If people in your group are not able to spend long periods of time on their feet, then consider fishing in areas where boats are the primary means of fishing. In a few years you may be the elder statesman and the younger generation will be your main fishing support so train them well. 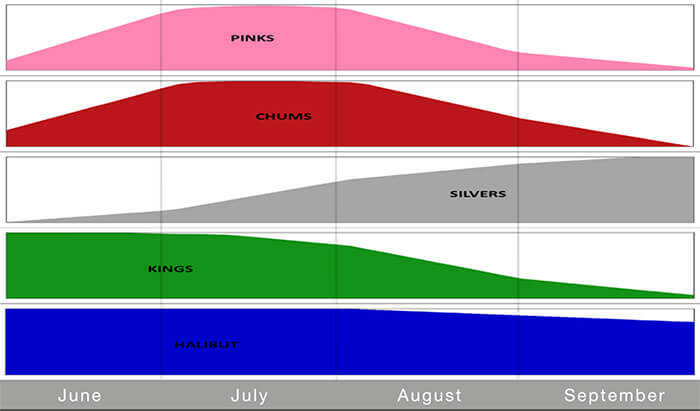 Run timing refers to when the fish will be in the area where you will be fishing. If you have a particular species that you want to focus on, run time is critical. If you want to catch kings (Chinooks), then come in the spring and early summer because that’s when they are moving through our area. Generally, the further south you go in Alaska the later the runs. In freshwater systems, timing is even more critical than in saltwater because in the streams you will generally be fishing just one stock of fish while in saltwater there will be multiple stocks going by. If you time the freshwater runs correctly (they can vary by 1 or 2 weeks from year to year), you will be rewarded with some of the best fishing experiences of your life. You hear about people who catch fish until their arms and hands ache – these are people who hit the run. More often though you will hear about fishing for days before catching fish, or “we were a couple of days late because the run had passed.” Saltwater fishing for salmon, while not as fast as ‘hitting the runs in streams’, is usually more steady and lasts much longer because you have more fish going by. Run timing on streams pertains primarily to migratory species like salmon, not the more resident species like rainbow trout and grayling, but should be a factor in planning your trip. Probably no other part of your trip selection is more misunderstood than freshwater versus saltwater fishing. More people say they are going fishing in Alaska to catch Kings than any other species, and they believe that you only catch kings in freshwater. Not true! The king fishery in saltwater has consistently high catch rates, bag limits are often more liberal, the runs last longer, and locations are generally less crowded. Another myth about saltwater fishing is that guides are always required. While it makes good sense to have a guide if you’re going into open ocean water, many areas, especially in southeast Alaska, have very protected water and self-guided fishermen do well. If you want to go self-guided be sure to check on how much help you get on the water from the outfitter that provides the boats. Halibut are the number two reason people go fishing in Alaska. Contrary to popular stories, sea sickness is not a prerequisite for a good saltwater fishing trip. Visualize a halibut fishing trip that takes 2–3 hours to get to the fishing grounds, fishing with 5 pound lead weights, and most of the sick people on one side of the boat while those who have already emptied their stomachs fish off the other side. Compare that with fishing within a half hour of the lodge with 1–2 lb. weights, in calm waters, with 2–4 people in a boat, and no one getting sick. Then you can see that all saltwater fishing trips are not the same. The latter description is typical of fishing at Doc Warner’s in Southeast Alaska. Remote fishing can refer to simply being away from road systems, or it can mean that the sites are only available by boat or by air. The locations may just be a short boat ride away from a population center or hours away. Remote stream fishing is very popular in the Cook Inlet area with access only by both aircraft or boat. The easier the access the more people you will share the fishing with. Streams that were once accessible to only a few now have float planes and boats arriving almost continuously to load and unload fisherman. Remote saltwater usually pertains to small villages with a charter boat fishery. However, some locations, like Doc Warner’s, offer a more private experience because they are away from communities and other lodges and provide for both freshwater and saltwater fishing. Remember, just because you can’t drive to a location doesn’t mean it won’t be crowded. Check it out! When the term self-guided fishing is mentioned in relation to fishing in Alaska, fear shows in the face of the inexperienced. Yet, this same person loads their own boat on a trailer and heads to their favorite lake with little concern. If you were given the choice of fishing your favorite location near your home in your own boat or with a charter guide, what would you choose? Most likely you would captain your own boat. Why should Alaska be any different? The difference is familiarity and experience. As mentioned earlier, if you are talking open ocean or large unprotected lakes, then guides are the way to go unless you’re very competent at handling a boat. However, in protected areas like Doc Warner’s, all you need to be a great captain of your own boat is good, consistent help on the water until you are familiar with the area and catching fish. At this point, it becomes your fishing trip and the experience of a lifetime. If you prefer the more ‘catered to’ experience with a boat captain who prepares the bait, sets the poles, nets the fish, and keeps you on the water for only 4-8 hours a day, then you are a candidate for the Charter Boat industry. Caution! It doesn’t matter which way you want to go. If you don’t know the supplier, ASK FOR REFERENCES and CALL THEM!! Recently, NOAA has lowered the Halibut limits for charter guests. Chartered guests cannot catch as many Halibut as self-guided guests. How much time do you want to spend in food preparation? If you don’t want to do any meal preparation, then you either need to go somewhere where there are plenty of restaurants or stay in a lodge. If you plan to eat out you will be in the majority of those who go to Alaska to fish, but this puts you in the areas where the crowds are. There just aren’t any remote restaurants. If you are going to a lodge, make sure you know what food they provide. Find out what is included in the price and what is considered extra. If you are going to do your own cooking, you need to consider how you will keep your chilled and frozen foods in edible condition. Can you live for a week on Campbell’s soup and hotcakes? Who will be your cook? Are your fish and your camp food going to compete for freezer/ice space? How much time do you want to spend fishing each day? Where you go and how you plan your trip will greatly influence how much time you can spend fishing. First, be aware that some locations advertise a multi-day fishing trip, but you arrive at mid-day on day 1 and leave at mid-day on the last day. You can fish on all days, but you don’t get full days of fishing. Again, what and where you fish can influence the time spent fishing. Charter boats, both for salmon and halibut, generally fish for a specific amount of time. You hire them for 4, 6, or 8-hour trips. Some charter boats only fish one species per trip, and may spend up to 6 hours just traveling to and from the fishing grounds. Roadside streams and lakes offer unlimited fishing time for you and the crowds who assemble for this type of fishing. Self-guided and remote, with both freshwater and saltwater fishing, and both halibut and salmon in the same saltwater areas are the ultimate for time spent fishing. Numerous species and varied locations in close proximity to the lodge leave most of the daylight hours for enjoying the Alaskan experience. A note of caution – check what is included in the self-guided experience. Some locations charge extra to arrange for halibut charters, and many do not provide help when you’re out fishing. It’s all included at Doc Warner’s. Bag limits refer to the number of fish, by species, that you can keep each day. Possession limits refer to the number of bag limits you can have in your possession. Read the current regulations (see Alaska Dept. of Fish and Game) to find what the limits are in the area where you plan to fish. In most cases the possession limit will be two bag limits. However, when fish are frozen, canned, or placed in an environment where they will keep indefinitely without additional care they are considered “reduced from possession”. When they are reduced from possession the 2-day possession limit no longer applies. Please see current Fish & Game regulations for exact definition of “reduced from possession”. When the trip is over and you have returned home to contemplate the experience that has been yours, what will be the things of most value? You will remember most vividly the events that created strong emotions. Such things as losing a big fish alongside the boat will create stronger memories than landing the big ones. Most of the guests who have been to Doc Warner’s comment about the beauty and magnitude of the scenery before they talk about the fishing. Getting more for your money than you expected caps the trip on a positive note, but feeling cheated and overcharged leaves long-lasting negative memories. When checking references be sure to ask about negative experiences people may have had. Remember, we don’t like to talk about things that make us look foolish, but once the emotion is awakened we will tell a full picture of the experience. Anglers who have fished elsewhere have often commented that their other experiences included poor or not enough food, extra costs such as fish processing, poles and reels, charters, and thinking they bought a packaged trip only to arrive and find that they only have housing with no food and have to make their own fishing arrangements. Finally, check the cancellation policies. They will range from giving all your money back to keeping most of it.